Right now, investment lags well behind what is needed to put the global economy on sustainable footing. Yet, renewable energy and clean technology investments are widely available. Climate finance has always been perceived as financial flows at the margins of the financial system that facilitate achieving the targets of the UN process on climate change (the UNFCCC). However, WWF’s work on green finance focuses on a system-wide change in financial markets. We support and contribute among likeminded organisations and parties in all efforts in the UNFCCC environment to scale up climate finance flows. However, we conceive mitigation and adaptation as cross-cutting activities in all sectors and aspects of the economy. We need to align financial markets with a low carbon future and we need to do it now. Climate change has been named as the most important challenge our societies face in the near future. It is also impacting all economic sectors and putting financial stability at risk. WWF understands that the energy transition is in process all around the world, where technological and organizational innovation and other market forces are increasingly shifting the traditional energy mix (based in fossil fuels) towards renewable energy sources. However, for climate reasons, we need to accelerate this energy transition and at the same time address other needs. This means scaling up funding to mitigate (reduce) emissions and adapt to climate change, despite the resistance of the status quo beneficiaries. Finance is a key way to shift our economies towards the new normal: low carbon resilient economies. Investments shape the future, and a future dealing with climate change requires that financial decision makers frame their decisions with an understanding of what this future will look like. Reducing emissions requires a comprehensive effort dealing with all emission sources and enhancing the efforts for adaptation finance. In the Road through Paris, the focus has been on the energy sector as the main contributor of CO2 emissions. WWF believes that a global energy system based on 100% renewables by 2050 is not only feasible, but necessary. Private and public finance react to market signals, but public money is also highly influenced by political decisions. Moving the market requires articulated work in different stages of the public and private spheres. Changing the practices of financial institutions is not an easy task, especially when this change is challenged by strong vested interests that would be negatively affected by changing the economy. Therefore, WWF uses a push-and-pull approach, through advocacy work, benchmarking best practices and supporting activism to influence financial institutions and authorities. Shifting finance is part of a wider change in regulations, institutions and policies. As financial institutions ask for certainty, an open and participatory process for a just energy transition can provide the certainty that financial markets require for shifting towards sustainable finance as instrumental for low carbon resilient societies. We work to influence regulators and enablers, such as the G20, International Monetary Fund, World Bank, the Green Climate Fund and multilateral development banks. We also work to shift investment of institutional investors (sovereign wealth funds, pension funds), credit rating agencies, specialized media and banks away from fossil fuels and into clean, renewable energy. It’s been called the fastest growing divestment movement in history… but what does it mean to divest from fossil fuels? Divestment is to withdraw financial resources from investments in equity and debt in fossil fuel related industries. It helps to rebalance the cost / benefit factor in the energy sector by making the cost of capital for the fossil fuel industry a little more expensive. 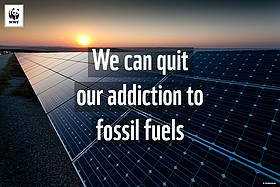 Divestment is important because current economic trends implicitly support fossil fuels and sustainable low carbon resilient investments are struggling to get the same ground level to compete for investments in the financial market. Moving societies to a sustainable low carbon future is a challenge. We need the action of all and urgently. Ask your banking institution to invest in a better future, ask them to be accountable for the money they manage. It is your money, it is your future. Climate finance: are we on track to meet the $100 billion commitment?